Mrs. Lorene Mulkey Reece, age 77, of Ellijay, died Tuesday, August 7, 2018. 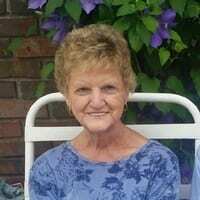 Mrs. Reece was born December 28, 1941 in Gilmer County the daughter of the late Denton and Venta Lee Mullinax Mulkey. She graduated High School in Barberton, Ohio, was a homemaker, and member of the Clear Creek Baptist Church. Her parents and brother; Jerry Mulkey preceded her in death. Survivors include: husband, Hollis Reece, sons and daughter-in-law: Art and Natalie Reece, Canton, Marc Reece, Ball Ground, daughter and son-in-law; Kelley and Benny Burgess, Ellijay, brother and sister-in-law: Larry and Carolyn Mulkey, Barberton, Ohio, sister and brother-in-law: Ernestine and George Hall, Ellijay, sister in-law and brother in-law: Ernesteen and Carl Clark, Ellijay, grandchildren; Daniel and Crystal Hyatt, Corey and Mac Reece, Heather Taylor; great grandchildren; Millie and Reece Hyatt, Grayson and Logan Taylor, several nieces and nephews also survive. Funeral services will be held Saturday, August 11, 2018, at 11:00am from the chapel of Bernhardt Funeral Home with Rev. Daniel Hyatt and Rev. Michael Smith officiating. Interment will be in the Oak Hill United Methodist Church cemetery. The family will meet with friends Friday from 4:00pm until 9:00pm and Saturday from 8:00am until the funeral hour. « Previous Article Short Takes - What is American Culture?